You forgot to download LeechFTP	. Click the link below to download it. The FTP web service is the most reliable method of transferring files to and from the Internet and also sharing them with anyone. The popularity of FTP is given by the large number of features it has, compared to other file sharing services. But in order to benefit from these features, you will first need to install a FTP client. The one that comes with Windows is difficult to use, having a command-line interface, and it's also very inefficient. But when installing the LeechFTP application, things change. That's because LeechFTP offers you a graphical interface for managing files and folders stored on FTP servers and also allows you to use FTP features with ease and in an intuitive mode. After running the application, the user will be able to connect to a FTP server in two ways, either by using the quick connect feature, which only requires entering the address, username and password or by using the site manager, which enables the user to store all his desired FTP server details inside the program's interface. After storing them, one will be able to connect to FTP without entering credentials again. After connecting to the desired FTP server, the user will be able to perform file and folder operations just like he would in Windows Explorer, because the interface of LeechFTP is pretty similar to it. As such, files can be copied or moved from a location to another using drag and drop or by accessing the graphical toolbar. During any program task, the file which is moved or copied will be displayed in real time inside the interface. In this way, the user will be able to spot any possible error. The FTP search feature included in the program's interface allows the user to quickly find any file located on the FTP server. It allows you to easily connect to any FTP server in several ways, either by entering the FTP location, username and password or by storing them inside a site manager, for connecting with a single click. Besides that, file operations can be performed using drag and drop. Furthermore, there is a FTP search feature included, which allows you to quickly find any file located on the FTP server. 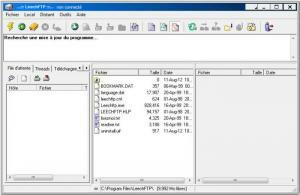 The full usage of the program requires some experience and knowledge regarding FTP servers. LeechFTP allows you to easily connect to any FTP server and perform file and folder operations using a Windows Explorer-like interface. You can download LeechFTP free here.